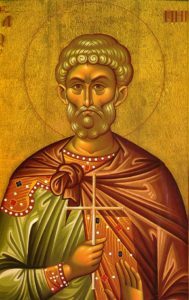 Saint Menas, who had Egypt as his fatherland, contested in Cotyaeion of Phrygia in 296 during the reign of Diocletian and Maximian. A soldier distinguished for his valour in war, he renounced his rank and withdrew to devote himself to ascetical struggles and prayer in the mountains. Filled with zeal and more than human courage, he presented himself in the midst of a pagan festival in Cotyaeion and declared himself to be a Christian. After terrible torments which he endured with astonishing courage, he was beheaded. His martyrium in Egypt became a place of universal pilgrimage; evidence of ancient journeys to his shrine have been found as far away as Ireland. The glory and refuge of the Christians of Egypt, he has been revealed to be a worker of great miracles and a swift defender for all who call on him with faith; besides all else, he is also invoked for help in finding lost objects. Brethren, it is the God who said, “Let light shine out of darkness,” who has shone in our hearts to give the light of the knowledge of the glory of God in the face of Christ. But we have this treasure in earthen vessels, to show that the transcendent power belongs to God and not to us. We are afflicted in every way, but not crushed; perplexed, but not driven to despair; persecuted, but not forsaken; struck down, but not destroyed; always carrying in the body the death of Jesus, so that the life of Jesus may also be manifested in our bodies. For while we live we are always being given up to death for Jesus’ sake, so that the life of Jesus may be manifested in our mortal flesh. So death is at work in us, but life in you. Since we have the same spirit of faith as he had who wrote, “I believed, and so I spoke,” we too believe, and so we speak, knowing that he who raised the Lord Jesus will raise us also with Jesus and bring us with you into his presence. For it is all for your sake, so that as grace extends to more and more people it may increase thanksgiving, to the glory of God. For the Founding members and all members of the Daughters of Penelope who have fallen asleep in the Lord. 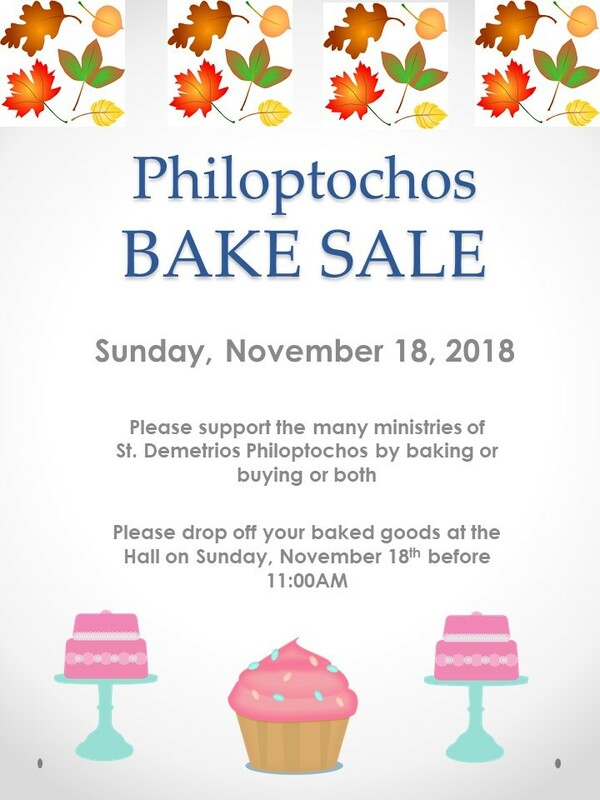 For the good health of the Daughters of Penelope members and their families. Stewardship is about giving of our time, talent and treasure. We thank all of our year 2018 stewards and invite these stewards and all of our parishioners to support Saint Demetrios Church in year 2019 by the pledging of time, talent and treasure. The Year 2019 stewardship financial goal is $ 295,000. We ask you to consider a 3% increase. THANK YOU! Bill Ypsilantis, Mona Monezis, Victor Demetriou and Harry Tangalakis. Join us next door for the Steward Appreciation Luncheon. Daughters of Penelope Food Drive Today is the last day of the food drive. All donations will be taken to Christ Community Church in Pompano. Lost and Found A wedding band was found and turned in to the office. Please call (954) 467-1515. Loving Stitches If you like to crochet or knit, this is the place to come!! We meet at 11:30am on the 4th Tuesday of every month!! We supply the yarn & needles. We can also teach you!! We make blankets & hats for Holy Cross, Broward General, & Joe DiMaggio hospitals. If you are interested please call 954-467-1515.